Beware this post contains unnecessary amounts of self praise, and minor recognition of procrastination. As you may have gathered I have finished the paintings I’ve been working on since January. Ok so not much of an achievement time-wise it should not have taken me that long but it is still an accomplishment! Better late than never right?! Now if you read the last two posts here and here you already know that I’d pretty much decided were I was going for this trio. I still doodled out some rough ideas for the composition. If you have trouble procrastinating like me, maybe try sketching out a plan for your canvas it could be on some scrappy paper. I think the main part is getting that pencil to paper and doing something. Although, word of warning… Think it through! I doodled a couple of ideas as you can see in my sketchbook above, and initially I was going for the one leaf filling the canvas a nice crisp grey background. Simple, it fit with the other two paintings and I could just get to work… But then I was tempted by this idea of having a bunch of leaves that overlap and that I could play with blending all the shades of green… So what did I do? Painted the wrong one is what I went and did! So really theres four in this set of leafy paintings and I hate that extra one. It was so unnecessary. I sketched it out onto the canvas and felt unsure and bam! thats were I should have hit pause. My advice if you feel like that, get back that paper we had earlier, where we doodled the ideas in the first place, yeah, use that to just loosely paint out your idea. Ok it won’t be a masterpiece but it could save you hours of working on the canvas and never being happy with it. I was not loving this painting, I could have kept working on it to ‘fix’ it but I knew that it was never going to sit with the first two paintings in harmony. Its too dark and the shapes are too heavy. So add a quick run to the craft store and enter a new fresh canvas. This time I stuck to the plan. One monstera leaf. Simple. Side note, I am still IN LOVE with the shade of green! That was a a superb choice. This time I knew that the subject was right, I just needed to keep it lighter than that first attempt. Another tip (I’m full of these today) if you are working on a series and you know they are going to hang on a wall together paint them together. I work in a pretty small space so I know its easier said than done but keep the other paintings in the series nearby, it will help when choosing colours, composition and pretty much all your decision making. 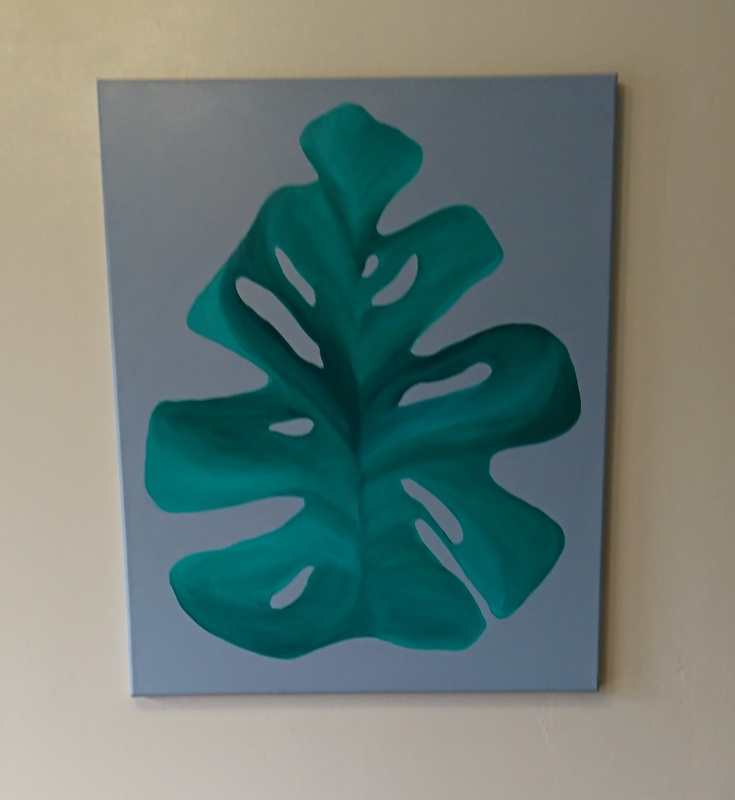 The final canvas turned out much better just because I kept the colours lighter, even though I liked how the monstera leaf looked with darker shadows it just didn’t work with the other two paintings. Now the three are living in harmony.